JUDAS CRADLE are a grindcore band from South Wales, formed in late 2014. Featuring Sam on vocals (ex-Onanistic Anti-Peristalsis), Ian on bass (ex-Onanistic Anti-Peristalsis), Will on guitar (ex-Goldie Lookin Chain) and Sean on drums (ex-nothing worth mentioning), JUDAS CRADLE play a vicious blend of impure thrashy grindcore and are currently single-handedly flying the flag for Welsh grind. In December 2014 the band self-recorded and self-released "The Self-Inflicted EP" demo and in June this year self-recorded tracks for an 8 way split with Holocausto Canibal, Kadaverficker, Basement Torture Killings, Gout, Nagasaki Birth Defect, Shitfuckingshit and Black Skies Burn, which is due out in late 2015. The band are writing tracks for a split 7" with Belgian grindcore band Anxiety Disorder, have self-released a music video, designed and screen printed their own shirts and are planning another DIY self-release, a live cassette EP. 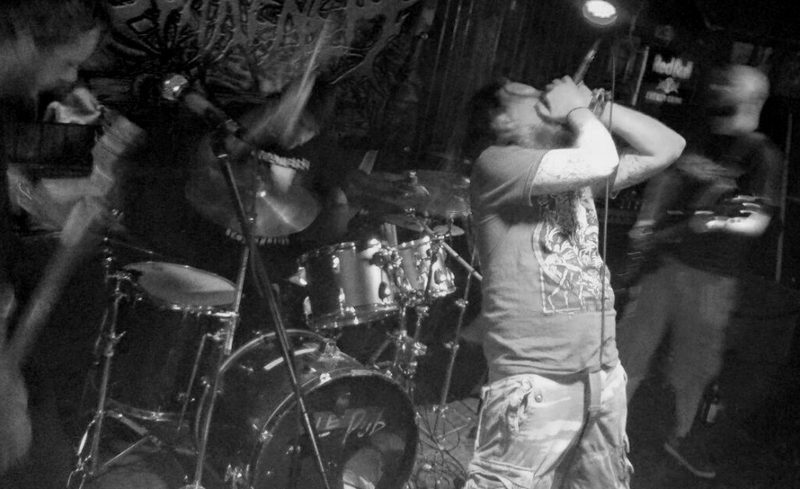 Over the last year JUDAS CRADLE has shared the stage with many underground bands such as Basement Torture Killings, Black Skies Burn, Crepitation, Columbo, Desecration, Evisorax, Fetus Christ, Foul Body Autopsy, Grand Collapse, Guttrench, Human Cull, Implore, Maruta, Necrosis, Prisoner 639, Rectal Smegma, Thanatos, VxPxOxAxAxWxAxMxC, Vitriolic Response, Warwound and many more. Sam (vocals) has graced the OEF stage once before as a naked lunatic for Desecration's set in 2013. If we return, he has promised to keep his pants on this time.